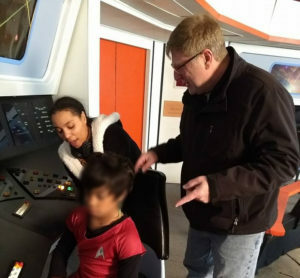 Apparently, there was an assumption made by SCOTT JOHNSON and KENT “WORDS” EDWARDS that the Starbase Studios sets were officially “closed” to filming last September after Glen Wolfe removed items from the building where everything was housed, making much of the Starbase sets unusable for filming. Glen Wolfe (right) along with one of the students playing Uhura (I’ve blurred the faces of all minors for privacy). Scott and Kent felt strongly that they should have at least been consulted about this visit, as they firmly believe that the sets belong to them, and that Glen was barred from using them. This has resulted in Scott and Kent announcing that “it looks like no deal will be reached” to avoid going to court. And as usual, the fan community is rapidly taking sides and going ballistic. Ladies and gentlemen, please remain calm and stay in your seats. In the lawsuit, Glen contests Scott and Kent’s claim of ownership and contends that nearly all of the current Starbase Studios sets are his personal property. Now, speaking only as an impartial observer, I think Glen has the weaker claim, but I’m not a lawyer or a judge. The only point that I want to make here is that the ownership status of the TOS sets has NOT yet been legally resolved. I repeat: NOT legally resolved! While this was awaiting trial in small claims court a agreement was reached for there to be NO USE OF the studio by any party until the situation was resolved. This was signed off of by the Judge and this is now most likely a contempt of court case which could mean more legal trouble for Glen and Dan and who ever let them in to the studio. Nope. Not even close to being close. According to Glen, no such understanding was ever agreed to by him, and certainly there was NO judge’s sign-off…ever. I’ve seen all of the legal filings, as has VANCE MAJOR (creator of the MINARD saga of fan films and who, I’ll explain shortly, is very involved in all of this), and neither of us ever saw anything from any court preventing Glen Wolfe from using or being on the sets…no agreement, no injunction. Scott and Kent claim full ownership, of course, but as I said, that ownership is still legally in dispute. So no, there’s nothing that would have officially prevented Glen Wolfe from using those sets for filming (or to help his friend film there). One interesting wrinkle to all of this (that’s left some fans scratching their heads) is that the sets are currently housed in a building owned by CHARLES “BUD” PELSOR…and Charles is one of the people being sued by Glen. So why would Charles even let Glen inside the building in the first place? Well, according to Glen, the two of them actually have an amicable relationship, and even if Glen wins the lawsuit, he has no intention of pressing to collect damages from Charles. Charles was only added to the lawsuit at the recommendation of Glen’s lawyer. Anyway, long story short for anyone thinking that Glen and his teacher friend and a bunch of adorable 11 and 12-year-olds broke into the building to film: no, they were happily let in by the building’s owner. HOW I SPENT MY WINTER VACATION – TRYING TO SETTLE THIS MESS! Assuming that a settlement agreement is ultimately signed and Starbase Studios continues to operate for fan filmmakers to use, our entire fan film community owes an incredible debt to Vance Major! I just need to say that up front. While Scott/Kent and Glen were seething, griping, fuming, and generally not communicating with each other, Vance was Switzerland and provided a conduit of communication because he was good friends with all three of them. Despite Vance’s own frustrations with Glen’s decision to remove items from the sets without the knowledge or permission of the others, Vance understood why Glen made that decision. (He didn’t agree wait the decision, but he understood Glen’s reasons.) And Vance continued for many weeks to work exhaustively with Scott, Kent, and Glen…trying desperately to negotiate some kind of settlement. Vance didn’t have any selfish reason for doing this. He’s pretty much done with Trek fan films and doesn’t intend to use the Starbase sets ever again. He doesn’t even want any credit. I’d written up a blog cheering his efforts, and Vance asked me not to publish it. Vance was simply doing this because, as the old Vulcan proverb says, “Only Nixon could go to China.” While other fan film people were grumbling, “Why don’t they just talk to each other and work this all out…?” Vance was the only one who could and was willing to step forward, listen to both sides, and try to carve out a settlement that was fair and acceptable to both sides. Glen is buying a $100,000 building and is willing to house the sets RENT FREE…indefinitely! That’s quite a commitment. And Glen’s ongoing expenses will be about $300-400/month for electricity, water, property taxes, insurance, etc. Scott has poured his blood, sweat, and tears into Starbase Studios for over half a decade. The sets probably wouldn’t have continued to even exist without him and Richard Wells maintaining them and supervising volunteers to help. And dozens and dozens of Trek fan films would likely never have bee produced without Scott and Richard offering fans low-to-no-cost access to the these wonderful TOS set recreations. Kent also had played a major role in making the bridge computer console displays work. Glen Wolfe would get 100% ownership of the sets going forward (since he’d be spending $100K of his own money plus thousands of dollars more per year housing them going forward). Starship Studios would be allowed to use the sets for free anytime they wanted to (providing they reserved them first with Glen and that Glen wasn’t filming something else at the time—and Glen had to be reasonable and not say, “Oh, sorry, we’re booked solid until the year 2030!”) So this meant that any fan production could simply go through Starbase Studios in order to have use of the sets for free (or for the cost of electricity for the day), just like it used to be. If Glen ever wanted to sell the sets, he had to first offer them to Scott and Kent for a $10 (yep, just ten bucks) price. If they said no, he could sell or dispose of the sets any way he wanted to. But Scott and Kent would have the right of first refusal. There were some other minor details, but that was essentially it. And there were some false starts. At one point, Glen’s lawyer advised him not to sign the deal as submitted by Vance. So Glen’s lawyer wrote up an agreement with more legally accurate wording. Now it was Scott’s turn not to want to sign, as point #3 above had been cleverly reworded with a loophole, which Scott’s legal advisor caught. And when I looked it over myself, yeah, there was that loophole, although I don’t think Glen was aware of it. I suspect it was just his lawyer trying to be protect his client. Unfortunately, that little bit of “protection” nearly killed this whole deal. That’s when I entered the story. I wasn’t planning on ever discussing my own involvement with negotiations here on Fan Film Factor. But Scott “outed” me yesterday on the Starbase Studios Facebook page, so yeah, folks, the cat’s out of the bag. I did help both sides come up with a revised settlement. Here’s what happened…. It was just after Thanksgiving, and Vance was nearly at his wit’s end. Both sides had gotten SO close—thanks to a staggering amount of patience and diplomacy by Vance—and now that Glen was refusing to sign Vance’s agreement and Scott was refusing to sign Glen lawyer’s agreement, Vance was ready to walk away from the whole thing in disgust. “Let me try one last Hail Mary pass,” I told Vance. Yeah, folks, I live in a world of hope. I contacted Scott and said (in my best Mr. Morden impersonation from Babylon 5): “What do you want?” Obviously, Scott wanted Glen to drop the lawsuit, which of course, was part of the agreement that no one seemed willing to sign. But what was it specifically in Glen’s agreement that didn’t work for Scott? Obviously, the loophole. But I could easily fix that by tweaking part of a sentence…and Glen was okay with it. So what else? I didn’t want to make that one tweak and then have Scott still refuse to sign. “What do you want?” I asked again. Come back tomorrow to discover what Glen said and what happened next. And I’ll also explain why I believe the only logical move now for everyone involved is to sign a compromise settlement agreement…and why I also believe that whoever refuses to do so will be known as the person(s) who ended Starbase Studios. A long time ago a friend of mine said that she thought I had it in me to change the world. Most days id laugh and go on abt my way. When I’m filming one of my low to no budget films, or discussing productions, I realize, I’m really lucky. I have met a great bunch of ppl. I don’t kno if I made the difference in the world my friend spoke of, but i kno that you all have made the difference to me, MY world is better off having you guys in it. Jonathan: Kudos to yourself and to Vance Major for the diplomacy ( and to other diplomats who may have worked on this). As an outsider who simply enjoys these films, I hope circumstances allow many more of them to be made in future. I truly hope that an agreement can be reached and Starbase Studios can be saved. It is and was a great place for people to come together, share their love for Trek and have fun. I still have faith, faith of the heart, that this will all work itself out. Fingers crossed! For accuracy, not really local, the Parkview Elementary kids came from Van Buren, Arkansas which is a 3-1/2 hour bus ride. Because the building where the sets care located has no electricity or facilities, Bud Pelsor graciously hosted more than 35 kids and parents in his large residence. He posted what the gathering looked like from his perspective on his Facebook page. Best way to resolve this. Close down the studio and demolish the sets completely. That way, both sides will be happy. SMH. It is this type of nonsense that certainly sours the fun in Star Trek and its fan following. Possibly. Remember that this was a field trip organized by their teacher for a video project, and schools usually are pretty strict about getting parental permission forms signed. I’m all for kids having fun in a Star Trek project at all, but did Glen, who admittedly I do not know and have never spoken with, consider at all that maybe yknow… timing? Considering that this field trip was set up initially by Glen and his teacher friend last June, cleared with the school administrators over the summer, announced to the parents and put on the schedule at the start of the school year in September, paid for in advance (they chartered a bus), and was something the kids and parents were looking forward to for months…no, I don’t think that “timing” was something that Glen was considering. And frankly, I don’t he he needed to. As I said, the sets had never been officially “closed” to him. Scott and Kent might have believed that, but as I explained, that was not the case in any legally enforceable way. Charles Pelsor is the landlord and can let anyone into his building that he wants. And since ownership of the sets has not been clearly established in court yet, there’s nothing stopping Glen from using them…nor Scott or Kent from using them. Just what we needed – more speculation with no evidence that something else, school permission slips, is a problem when there’s no evidence at least here that was the case. It’s why more and more I feel that Star Trek is dying and should be allowed to die in peace. Like the late Leonard Nimoy, Jerry is right. Star Trek has run its course. It’s gone as far as it can go. All the more reason why it should end. Personally and artistically, it should have ended if NBC had let the show have its fourth and fifth seasons during the 1969 and 1970 & 1970 and 1971 television seasons. At least TAS covered the fourth season and both ST-NV/P2 and (I hate to say)STC covered the fifth and final season. Some of the best Star Trek ever happened AFTER the original series was canceled: The Wrath of Khan, Best of Both Worlds, The Inner Light, the last three seasons of DS9, the Star Trek Experience in Las Vegas…I could make a list a mile long. Maybe to some, but to others, I’m not so very wrong. While I’ll admit 110% that The Wrath Of Khan is one of those best things about Star Trek, the fact of the matter is this. The internal politics of Star Trek fandom has truly shown the ‘dark side of fandom’. To the point where fans have wielded their fan power in an out of control manner and let it rear its ugly head. And look what has happened. It has gotten to the point where the politics in the Star Trek fan community has escalated into violating moral, legal, and ethical boundaries. All the more reason why CBS/Paramount had to step in and assume control. I hate to admit this, but there may have been some truth in Bill Shatner’s 1986 SNL skit. Let alone when Walter Koenig once pointed out that fans may be ‘lauding a ghost’ now. Star Trek fans, like Star Wars fans, have gone nutty over the years. And this is the end result of such undisciplined and illogical(pardon the pun)minds. Their immoral actions had consequences. Consequences that pretty much put an end to fan film productions and internal fighting between those behind such productions. To quote a phrase from the late Peter Preston in STII – TWOK, if no one can tell the difference….or I should say differentiate from what is right and what is wrong in the issue then ‘they are as blind as a Tiberian Bat!’. And yet, Star Trek has always been about seeing hope…turning death into a fighting chance for life. That’s the way I choose to see this…and why I write this blog I’m sorry that you’re not only willing to give up hope but are trying to use Fan Film Factor to convince others to do so, as well. Maybe it’s finally time, Blue, for you to just walk away from Trek fandom and piss onto the tent from the outside, not the inside. Just a suggestion, since the rest of us really are still enjoying our fandom and our franchise…and you’re making things smell a bit. How much money have SCOTT JOHNSON and KENT “WORDS” EDWARDS put into these sets? I’m going to take a wild guess its well under $2000. Glen Wolfe has been keeping those sets together for years, and everyone knows it. And why should VANCE have any say in what happens to those sets? He doesn’t contribute financially to those sets. Just as I don’t want any Glen-bashing on this blog, I don’t want any Scott and Kent-bashing either. Scott (along with Richard Wells) is the main reason those sets made it past 2011 in the first place. He made Starbase Studios a reality and kept it going for years. Kent was a big part of it, too. So was Glen. And to be honest, so was Vance. As for why Vance has a “say” in what happens to those sets, did you read the blog? Vance was the only one who stepped in to help both sides talk to each other and actually succeeded! Others tried and failed (including Alec Peters, who really did just want to help both sides come together), but Vance had the patience of a saint. He went back and forth between two VERY angry sides of a seemingly impossible-to-solve issue. He formed a bridge of communication and, when it seemed like there was no imaginable way to compromise and reach a settlement that both sides could live with, Vance managed to find one. Granted, it still needed some tweaking (see Part 2 of this blog)–and that’s where I came in–but Vance created the foundation and framing of a contract that, before he got involved, seemed like an impossibility. So please step back, Reilly, stop the bashing, and let the healing begin. Please. Actually, 100% true. I watched it happen. And what you saw may have been a smokescreen for his ulterior motives. Something that I WOULD NOT put past him. Again, Blue, totally off. Look, say whatever else you want about Alec Peters, but the man is VERY supportive of fan films…and especially Starbase Studios. He was there when Starbase Studios was just getting off the ground. And even though Alec (and Vic and John Kelly) all went their separate ways in early 2010, Alec was always a fan of Starbase Studios and what they did for fan films. Keep in mind, Alec is the reason I do this blog. And no, it wasn’t just to be a cheerleader for Axanar. If it were, I wouldn’t have over 400 blogs about fan films OTHER than Axanar. Alec wanted there to be a blog site dedicated to nothing BUT Trek fan films. He wanted them to get the recognition and respect that they deserved. There was no ulterior motive. Axanar was either going to happen or else get stopped by the studios. This blog wouldn’t change that outcome. But Alec encouraged me every step of the way and introduced me to many fan filmmakers early on. There’s a misperception that Alec is a pariah among fan filmmakers. That’s not the case. Sure, some folks in the fan filmmaker community resent Alec for this or that reason, but others see him simply as the one who got sued first…and if it hadn’t been him, it would have been Renegades or STC or some other fan production. Trust me, Blue, I walk in this world. 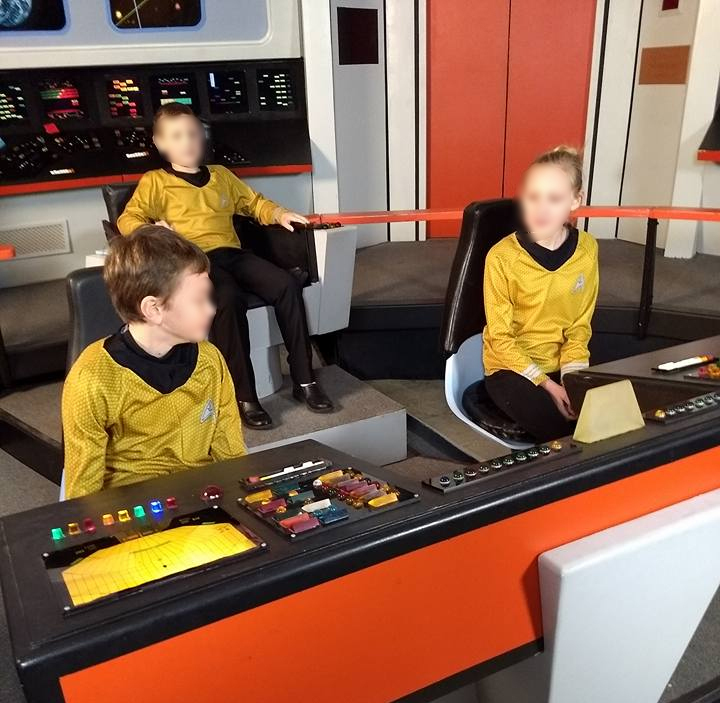 I do a LOT of features on fan productions and interviews with their creators, and those blogs appear not only here but also on the AxanarProductions.com website as part of my weekly sister blog, Fan Film Friday. If Alec were the pariah you think he is, don’t you think more fan producers would have a problem with their projects and interviews being featured on the Axanar website? I think you have miscalculated in the stumping department, Jonathan. Nevertheless, let me ask you this. If Alec wanted there to be a blog site dedicated to nothing BUT Trek fan films and he wanted them to get the recognition and respect that they deserved, then why were charges of copyright infringement and making a profit off of the Star Trek property leveled at him? Why did he commit those violations in the first place. Especially after his unethical business practices concerning Propwerx many years past. Care to comment on those specific issues? And that’s all I am going to say about this, Blue. If you want to go back and read any or all of my sixty Axanar-related blogs and the back-and-forth comments, you are welcome to do so at your leisure. You can find them all starting here. But I’m done commenting on the same old arguments and accusations that have long since become irrelevant (the case settled and fan films are still being made). So I’m closing this topic, Blue. Any more posts from you trying to stretch out this dead-horse-beating will simply be deleted because I just don’t have time to do this all again. It’s too exhausting. Thanks, but no thanks. I’d rather read something constructive like Sir Arthur C. Clarke’s science fiction classics than your sixty-odd blogs concerning your not so eloquent views on Axanar. Consider that final word in the matter. Star Trek also pointed out that all things end when time demands of it. After fifty years and the fans suddenly making a mess of things due to warped and perverted fan politics, I’d say that time has come. And it came in the form of Axanar and the people behind it. In order for you to be right, Blue, Star Trek would have had to have come to and end. Discovery is renewed for a season 2. Taratino Trek is green-lit. “Please Stand By” will be coming out soon. The Deep Space Nine documentary “What We Left Behind” broke a Kickstarter record for a documentary with $648,000 in fan donations! And Trek fan films continue to get made and released at a rate that I can barely keep up! SMH. And I thought that the U.S. Government was desperate to keep something alive in Capricorn One. Hence why they resorted to such immorally and unethically bankrupt methods. The late Richard Nixon would have been proud of such unlawful actions concerning Star Trek fandom. Maybe you just don’t want to admit that certain parties in Star Trek fandom have repeated the franchise fatigue situation that almost led Paramount’s huge moneymaker to an end some years past. Only in this case, the situation was exacerbated by certain individuals violating civil and moral ethics and laws. They got too ambitious and other fan films paid the consequences for their foolish actions. If the ONLY way to keep something alive is to become everything that is morally and ethically wrong, then it is NOT worth keeping it alive. An alternative universe, huh? That’s a first. Yep, alternate universe. Here’s how I know. You’re actually ignoring my list of real-world money-making examples entirely, and instead you’re saying that “certain parties” who are no longer actively associated with Star Trek have casual opinions that the franchise is “fatigued.” So here I am holding up all of these actual examples of how Star Trek is thriving, and you’re choosing to not see or acknowledge them. I can only assume it’s alternate universe syndrome on your part, Blue…or just that you’ve checked out mentally. Either way, you obviously don’t pay attention to actual reality, and so it’s hard for me to discuss reality with you. Maybe it’s time I just gave up and let you go back to your own universe. You’re not really adding much to this one…at least as far as Star Trek is concerned. Actually, I do pay attention to reality. If anything needs to be checked out, it is the wormy apples that have soured Star Trek fandom. If anything has been added to the Star Trek universe, it’s the sad fact that fans have let their fan devotion convert Star Trek fandom into a pigmire. Or worse a toxic sewer over-run by those who have no comprehension of the difference between fandom and fanaticism. Funny how all of these forms of fan politics have mirrored the infighting between Khan’s supermen and the war between the two inhabitants of Cheron. Jerry was right in his description about Star Trek dying peacefully. Now all we need is an urn for the ashes. A Star Trek film directed by Quentin Tarantino green-lit? Yeppers, Star Trek is ready for the urn. And a rusted one at that. Yawn. You still here, Blue? Yawn. For now. But not for much longer. You’ll learn the truth, eventually. Just don’t be so surprised when it all comes out the way others – including myself – have described it. Any way to speed that up? I could say the same about both Alec and David leaving Star Trek fandom forever. The difference between you and Alec Peters/David Gerrold is that you just said “But not for much longer…” when I asked, “Are you still here?” So that sounds like you’ve got one foot out the door, Blue. Why not finish the journey? Alec and David aren’t going anywhere. They’re both still very involved in Star Trek fandom and other creative endeavors. They haven’t announced that “But not for much longer…” like you did. So no, Blue, you really CAN’T say the same about Alec and David leaving Star Trek fandom forever. They WANT to remain a part of it. You don’t. You exist in fandom simply to keep predicting its demise, month after month, year after year. Maybe you feel that if you stick around long enough, you’ll eventually be proven right. But one could make the same claim about predicting a huge meteor collision with the Earth. Personally, I think your repeated “THE END IS NIGH!” prognostications are a waste of both our time. If anything has been a waste of time, it has been the fan politics souring the milk of Star Trek fandom. Smoke that in your impulse engine.